What a wild ride through the rough landscape these outlaws are taking! 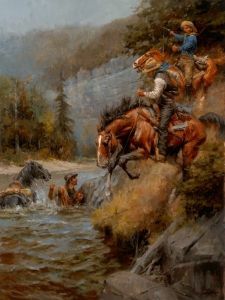 With no place else to go, these men drive their horses into the river hoping to escape the posse that must be in hot pursuit of them. These desperados are trying to beat the odds of being captured as they make their escape into the water. Andy Thomas's work has been compared with the late Remington as a master storyteller in his images. With all the color and action of a wild West scene, Thomas brings the viewer into the story and makes his characters come alive.